How fascinating that the ending was changed! I only saw it once (although I played the soundtrack endlessly), and my main memory is of being disappointed by the ending, but feeling like it was the ending that Hollywood required. Funny that it was really the audience in the driver seat. “Let’s plow” was one of my favorite Duckie lines. Love Duckie! I just saw this last night at the Paramount Theatre in Austin, as part of their summer film classics series, which they’ve been doing for 35 years. Good stuff. This is perhaps my second most-loved movie (after Gone with the Wind, which I have seen about 120 times). Pretty in Pink is the first movie I remember seeing at the theater. I was seven. I think I’d seen some cartoons before with my mother, but this is definitely the first one I remember. I was excited, even though I was only seven (and, watching it now, I wonder whether it was appropriate!). Watching this again last night on the big screen, I was so giddy when the title music started! My friend and I had some great laughs about the Eighties fashion, and I realized that I think I am now older than the history teacher! But I loved every single minute of watching this film, and I know every line. I also realized how many small ways this film has affected my life. I’ve spent the last 20 years looking for a red silk robe like the one Andie wears in the “I hate eggs” scene. I love Otis Redding because of this movie, and the famous Jon Cryer scene makes me ridiculously, giddily happy every time I see it. 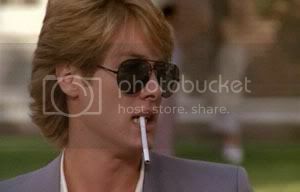 When I was 25, I developed a crush on James Spader, and I now enjoy his scenes all the more – he’s deliciously terrible. I agree that the prom dress was way, way better before. And I always liked Duckie better.